If you were a black African during apartheid, becoming a lawyer was almost impossible. Gaining entrance to a university was extremely difficult, with high fees, political demands and an intransigent government presenting almost insurmountable obstacles. The University of the Witwatersrand Law Faculty, for example, had only eight Africans studying at any one time between 1949 and 1962. By 1963, only four Africans had ever graduated from the Wits Law Faculty. Duma Nokwe and Nelson Mandela were two of these: a testament, if ever there was one, to why both were considered to be among the most remarkable figures in mid-century Johannesburg. Of course, once a black lawyer finally received his/her degree, they had to face the indignities of discrimination in court and the depredations of a hostile government. In 1956, for example, the state banned Nokwe from appearing at any gathering exceeding three people anywhere outside Johannesburg - a restriction that prevented him from taking any cases outside of the city. During a case in Bethlehem, judges tried to humiliate Nokwe by asking that he take a seat at tables 'specially set aside for non-European advocates and attorneys'. 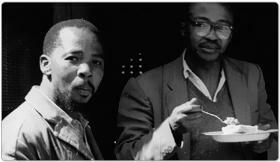 When he was finally allowed to appear in court outside of Johannesburg, as he did during a case in Bethlehem, judges tried to humiliate Nokwe by asking that he take a seat at tables "specially set aside for non-European advocates and attorneys". Nokwe, of course, was not the only victim. In 1958, Godfrey M Pitje (a candidate attorney for Mandela and Oliver Tambo) was fined for contempt of court after stating that he refused to remove himself to a "non-European table". When he appealed the order, the appeal court held that the magistrate was competent and his actions correct. Pitje was forced to pay a fine of five pounds, or face five nights in prison. These obstacles to the legal profession for black Africans persisted for the forty years of apartheid, and severely limited the number of practising black lawyers. It is no surprise then that, by 1989, of 1 089 advocates operating in South Africa, only 2.6 per cent were black, 1.6 per cent coloured and 5.1 per cent Indian.